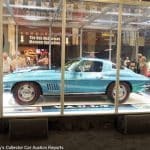 Worldwide Auctioneers brought an unusually varied docket to their Scottsdale auction which kicks off the succession of auctions in parallel with Barrett-Jackson. Older cars were particularly prevalent, both in the sense of their age and in regard to their aged appearance. Barn finds? Absolutely, but also several unrestored or repainted largely original pieces such as the ’57 Bel Air Fuelie and the 300SL Roadster. The ’31 Stutz Blackhawk roadster epitomized true barn find dreams, a complete old car that actually ran and drove. And then there was the Bentley 3-Liter Red Label Speed Model tourer, which had never been allowed to descend into neglect and begged to be driven some more so its patina didn’t go to waste. 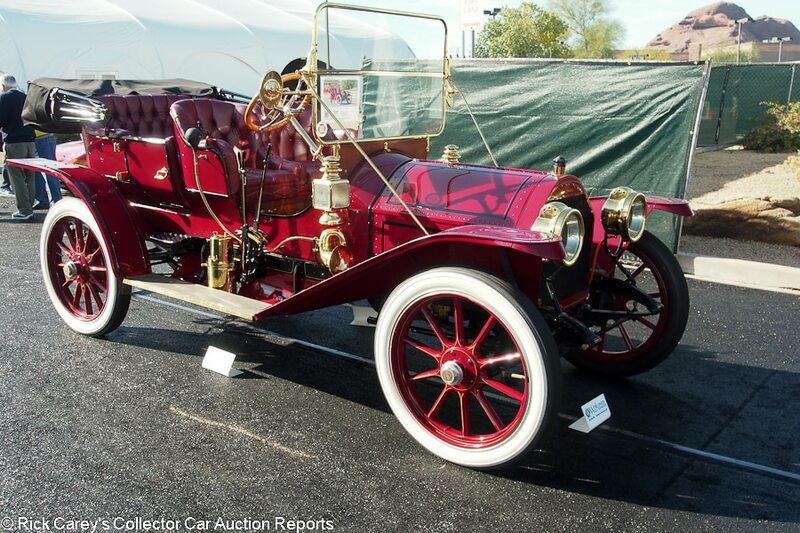 Now in its third year in Scottsdale, Worldwide’s Wednesday auction is an early hint of the mentalities of buyers and sellers for a variety of cars not seen in any significance at either Mecum’s Kissimmee auction the weeks before or in the first few days of Barrett-Jackson. This year the hint was positive, with the sale total up just over 50% from 2018 (although still off from Worldwide’s first year total), a healthy sell-through rate and strong average and median transactions. 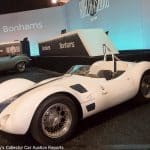 But Worldwide’s results also hinted at the difficulties to be encountered later in the week among high end consignments as both the Bugatti Type 35A and the Ferrari Daytona failed to meet their consignors’ expectations. Only the highly original 300SL Roadster countered that trend and it, like 81.8% of the transactions at Worldwide, sold on a hammer bid below the pre-sale low estimate. The cars that follow are sorted by Marque and Model for easier reference. Rick Carey takes all the blame for what is presented and for the photos: good, bad or indifferent. Lot # 21 1958 Alfa Romeo 1900 Sport Coupe, Body by Autotechnica del Lario; S/N 1; Red/Black leather; Estimate $350,000 – $425,000; Rebodied or re-created, 3 condition; With Reserve; Hammered Sold at $240,000 plus commission of 10.00%; Final Price $264,000. – Silver wires, Dunlop tires, Jaeger gauges, Moto-Lita woodrim steering wheel, sliding side windows, 4-wheel disc brakes. – Recent period-style coachwork, one of several similar examples by this coachbuilder according to a reliable source. Poor repaint over old paint, masked by feel and orange peely. Dented left front fender and cracked wheel arch. Sound, lightly stretched upholstery. Uneven door fits and uneven gaps. Clean, orderly engine compartment. Odd front fender profile. A neat but rather sketchy thing. – With abundant characteristics of a competition Alfa, the aura is intriguing, but the execution is less than enchanting. This result is realistic for a car that will never get invited to the Mille Miglia, an Italian kustom kar with sporting aspirations. Lot # 24 1935 Auburn 851 SC Boattail Speedster; S/N 33807E; Red/Camel leather; Camel cloth top; Estimate $750,000 – $950,000; Older restoration, 3+ condition; No Reserve; Hammered Sold at $575,000 plus commission of 10.00%; Final Price $632,500. – Columbia 2-speed axle, chrome wheel covers, wide whitewalls, Crosley radio. – Good older restoration let down by poorly applied and masked coachlines and overspray on the frame. Edge chips at the edge of the right side of the hood and by the golf bag door. Sharp chrome and interior. Represented as the original body, frame and engine but never verified by the ACD Club. – A staple of Worldwide auctions, it was sold at Houston in 2007 for $429,000 and at Auburn in 2010 for $434,500. It remains in essentially the same condition here as it was nine years ago yet brought a superior price, particularly since it doesn’t have ACD certification. 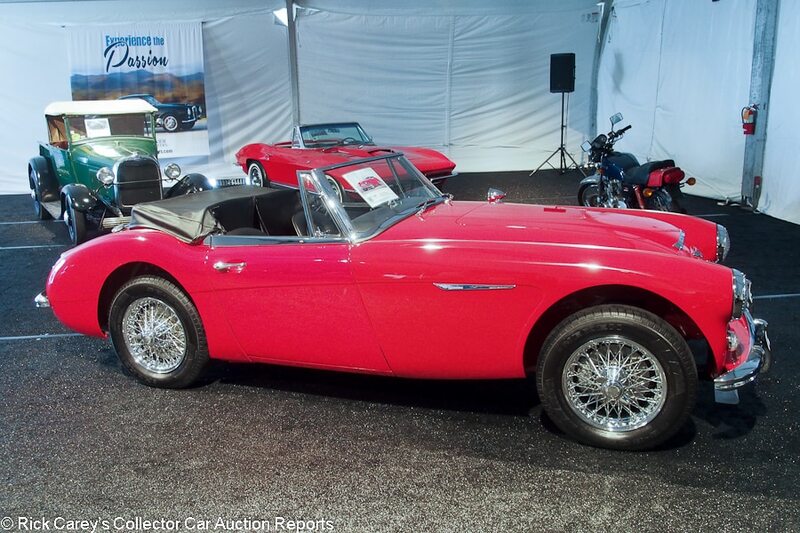 Lot # 9 1965 Austin-Healey 3000 Mk III Phase 2 Convertible; S/N HBJ8L30063; Engine # 29KRUH4789; Colorado Red/Black leatherette; Black leatherette top; Estimate $70,000 – $90,000; Older restoration, 2- condition; No Reserve; Hammered Sold at $70,000 plus commission of 10.00%; Final Price $77,000. – Chrome wire wheels, Nexen tires, overdrive, tonneau cover, BMIHT documented – Sound older paint with touched up chips. Flat panels, even gaps and flush fits. Good chrome except for pitted vent window latches. Good glass. A quality older restored Healey with a few miles. – Sold by RM at Amelia in 2007 for $96,250 fresh from its Healey Lane restoration, then again by RM at Monterey in 2012 for $66,000. The result here is somewhat surprising although the quality of the restoration and its preservation are exceptional despite the 5,461 miles that have been added to the odometer in the past seven years. The Healey has all the hallmarks of a pampered life which the bidders recognized with this price. 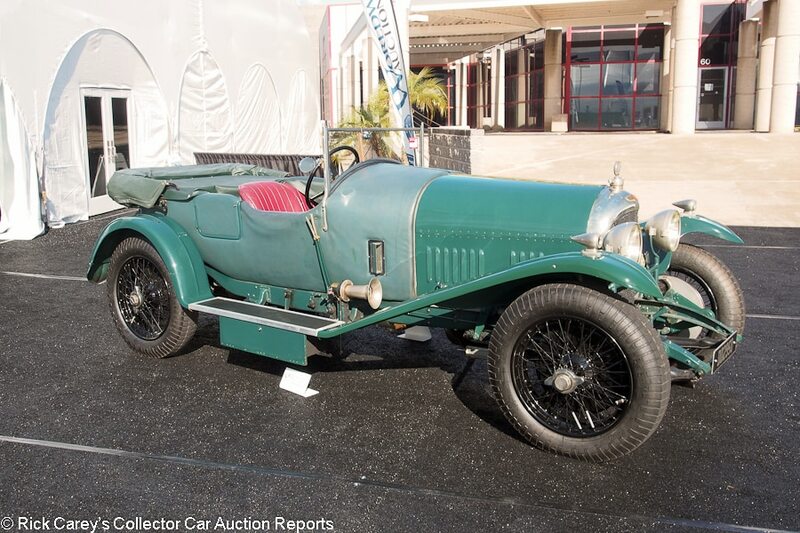 Lot # 35 1924 Bentley 3-Litre Red Label Speed Model Tourer, Body by Vanden Plas; S/N 610; Engine # 1005; Green/Red leather; Green leatherette top; Estimate $400,000 – $500,000; Older restoration, 3- condition; No Reserve; Hammered Sold at $300,000 plus commission of 10.00%; Final Price $330,000. – RHD. Black wire wheels, Blockley tires, tonneau cover, rear-mounted spare, two SU “sloper” carbs. – Represented as the original Vanden Plas coachwork but a later engine block from s/n 990. Sound, edge chipped paint, faded fabric body. Dull nickel and chrome brightwork. Surface cracked seat backs, newer cushion upholstery. Not new but wonderfully preserved old gauges. – During the preview this Bentley was admired by just about everyone, less for its condition, which is aged and used, but mostly for its eminent suitability for being driven and enjoyed. This is a car that offers no apologies but is sound and usable in a way few automobiles of its age and stature are, most of them being restored to the point where a stone chip from enthusiastic motoring is unthinkable. There are many issues and a Bentley expert might take exception to much of it, but on the road on a bright, crisp fall day it will be a delight, and one bought reasonably in this transaction. 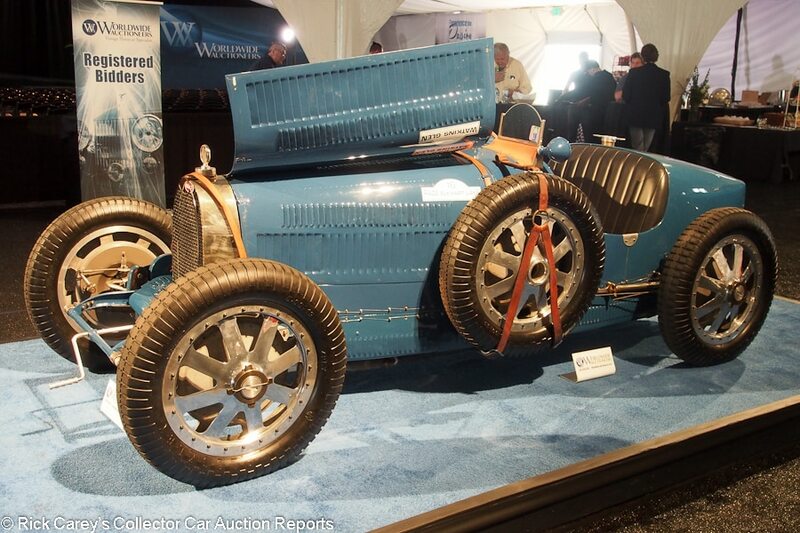 Lot # 55 1925 Bugatti Type 35A Grand Prix; S/N 4631; Engine # 43A; Blue/Black leather; Estimate $1,900,000 – $2,400,000; Competition restoration, 3+ condition; With Reserve; Not sold at Hammer bid of $1,300,000. – RHD. Single left side spare, no fenders or headlights in the preview although pictured in the catalog with Marchal headlights, dual aeroscreens, 8-spoke alloy wheels, Blockley tires. – Historic race prepared with good cosmetics. The engine block and cam box are smooth, not scraped, represented to be the original engine. Possibly with early racing history at the 1926 Provence GP driven by Louis Chiron, his first circuit race. 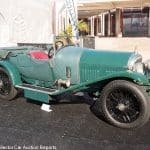 Restored by Competition Motors in the early Naughts with a 2.3 litre crank. A sound, well-maintained early Bugatti Type 35A. – The reported high bid here is appropriate to this Bugatti’s configuration and history. The inference of early Louis Chiron history is only that, an inference, and is not enough to support the rather exalted pre-sale estimate range. 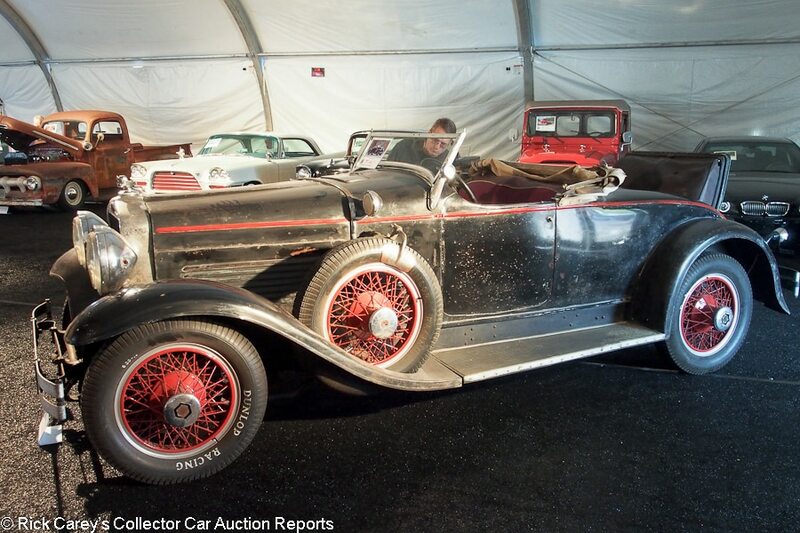 Lot # 67 1910 Cadillac Model 30 Demi-Tonneau; S/N 40063; “Bing Cherry” Red, Black accent/Red leather; Black cloth top; Estimate $80,000 – $120,000; Older restoration, 3+ condition; No Reserve; Hammered Sold at $82,500 plus commission of 10.00%; Final Price $90,750. – RHD. Gray & Davis halogen-converted acetylene headlights, taillight and non-operating sidelights, acetylene generator, bulb horn, body color wood spoke wheels, whitewall tires, New Haven clock, 12 volt electric starter. – Restored in 2014 after years in disassembled storage and driven over 1,500 miles since. Sound older repaint over old paint. Cracked left front hood corner. Good brass and wood. A sound and usable car for tours and events. – This Cadillac is a really good old thing and seems to need nothing to be toured and enjoyed on weekend outings. 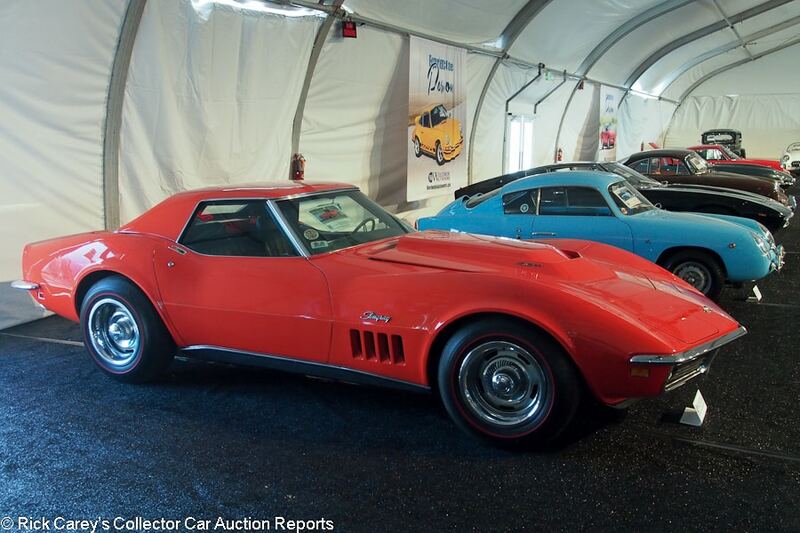 The Worldwide Scottsdale bidders appreciated its quality and performance with a healthy but reasonable price. 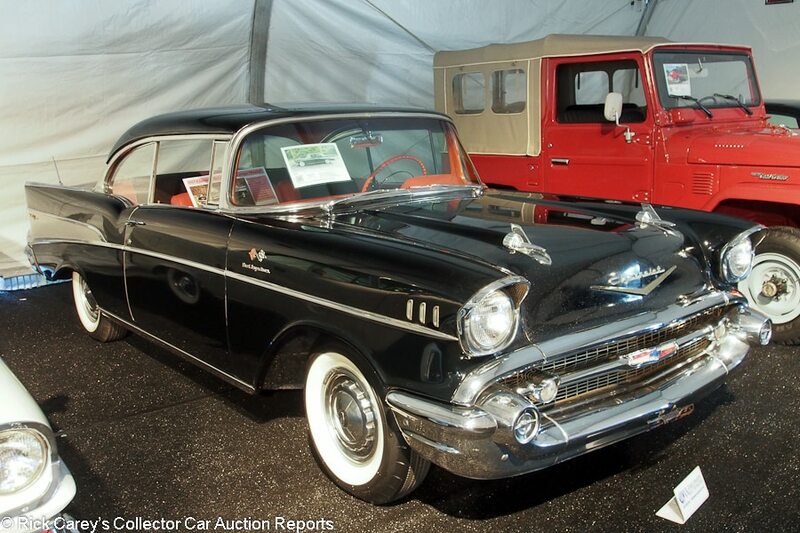 Lot # 54 1957 Chevrolet Bel Air FI 2-Dr. Hardtop; S/N VC57K162031; Engine # F418GF; Black/Red vinyl, Black cloth; Estimate $80,000 – $100,000; Unrestored original, 3- condition; No Reserve; Hammered Sold at $55,000 plus commission of 10.00%; Final Price $60,500. – 283/250hp fuel injection, 3-speed, power brakes, wheel covers, whitewalls, skirts, dual rear antennas, pushbutton radio, heater – Stone chipped and polished through original paint. Unrestored engine with some new wires and hoses. Faded original upholstery. Represented to be the original engine and all-original, although the owner’s description and the engine number say Turboglide but the three pedals and column shift lever say 3-speed. It’s a find, nevertheless. 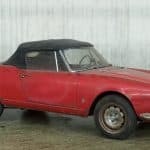 – Replacement lot for a 1961 XKE SI Roadster, this is a worthy successor and a remarkable survivor car with only a swapped transmission separating it from its original configuration. The best thing about it is that its condition is largely acceptable and usable and its originality is too good to be messed with, particularly at this modest price. 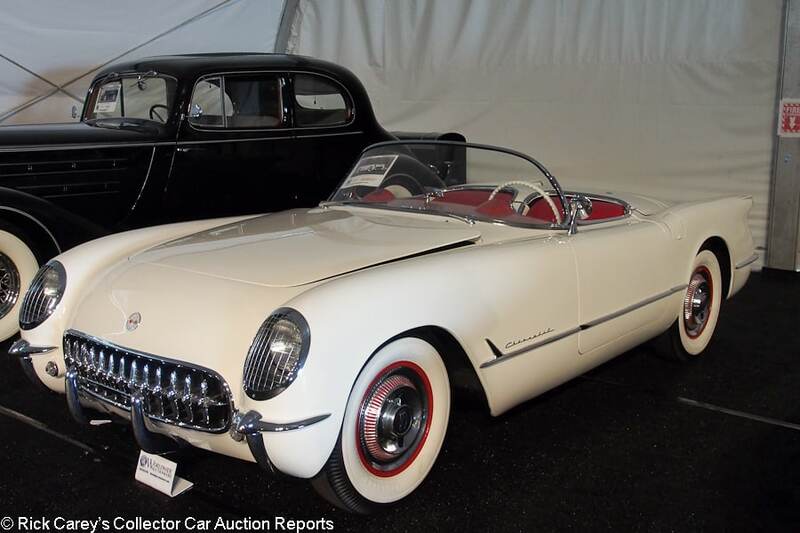 Lot # 68 1953 Chevrolet Corvette Roadster; S/N E53F001209; Polo White/Red vinyl; Black cloth top; Estimate $240,000 – $270,000; Recent restoration, 2+ condition; With Reserve; Not sold at Hammer bid of $200,000. – WonderBar radio, Powerglide, spinner wheel covers, wide whitewalls. – Showing 8 test miles after restoration. number 209 of the 300 built in 1953. Spotless show quality engine bay. Fresh paint, chrome and interior although the paint is so thick there’s no visible fiberglass cloth weave. It is every bit the recently completed show car it’s represented as and looks ready to take on the Corvette show circuit. – Worldwide tried to sell this Corvette at Texas last April where it was bid to $230,000. Then RM tried at Auburn Fall with a bid of $210,000. It’s now $200,000 and the trend is clear. It’s time to take any reasonable money that’s put on the table.. Lot # 64 1969 Chevrolet Corvette L88 Roadster; S/N 194679S736083; Engine # T1029LO 19S736083; Monza Red, Monza Red hardtop/Black vinyl; no top; Estimate $590,000 – $640,000; Unrestored original, 3+ condition; With Reserve; Hammered Sold at $475,000 plus commission of 10.00%; Final Price $522,500. – 427/430hp L88, 4-speed, Rally wheels with hubcaps and trim rings, Goodyear red line tires, power brakes, heater, radio delete, two tops, tilt/telescoping steering column, speed minder. – Bloomington Gold Survivor, NCRS Top Flight, the last ’69 L88 Roadster built. Checking original paint. Good original chrome and interior. Clean and impressively maintained everywhere but also aged and used. – Condition is aged and easing toward requiring a repaint that will seriously compromise its originality, the bidder looked upon it as handicapped and were sparing in their bidding but the consignor recognized reality and took the money, a result that is fair to both the buyer and the seller, but more favorable to the buyer. 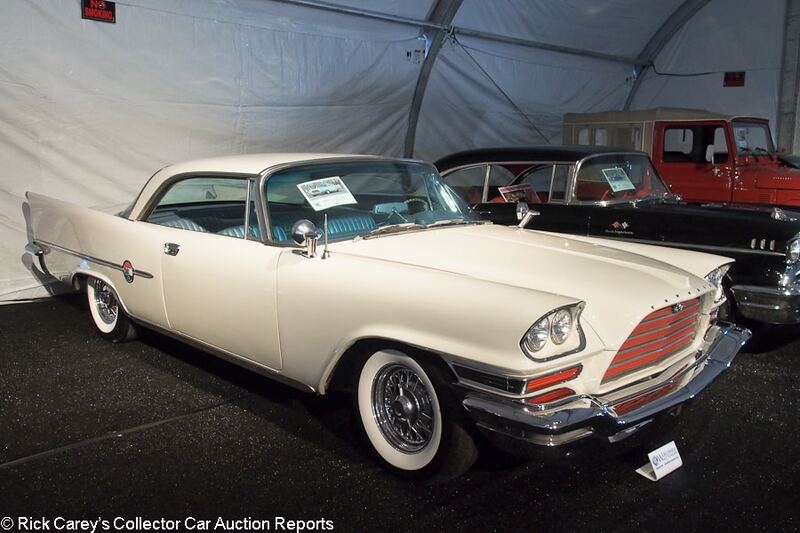 Lot # 41 1959 Chrysler 300E 2-Dr. Hardtop; S/N M591100657; White/Light Blue leather; Estimate $40,000 – $60,000; Visually maintained, largely original, 3+ condition; No Reserve; Hammered Sold at $45,000 plus commission of 10.00%; Final Price $49,500. – 413/380hp, dual quads, chrome wire wheels, whitewalls, dual mirrors, pushbutton automatic, pushbutton radio, armrest, power steering, power brakes, power windows, power swivel seats, air conditioning. – Special order interior color. Factory wheel covers in the trunk. Cleaned up unrestored but complete engine bay with plenty of leaks and dribbles. Presentable repaint over old paint and decent chrome. Lightly wrinkled but quite good original upholstery. Tidy underbody. Arguably a good enough Letter car to enjoy as-is, but it would make for a fairly straightforward restoration. – Sold at the Leake auction in Oklahoma City last February for $64,900, it has added just 41 miles to the odometer since then and other than eleven months and those 41 miles nothing has been done to it. The bidders valued it appropriately here for its preservation, with due reservations for its condition. Restored it would be worth twice as much, but would cost the earth, moon and stars to be restored to show condition. 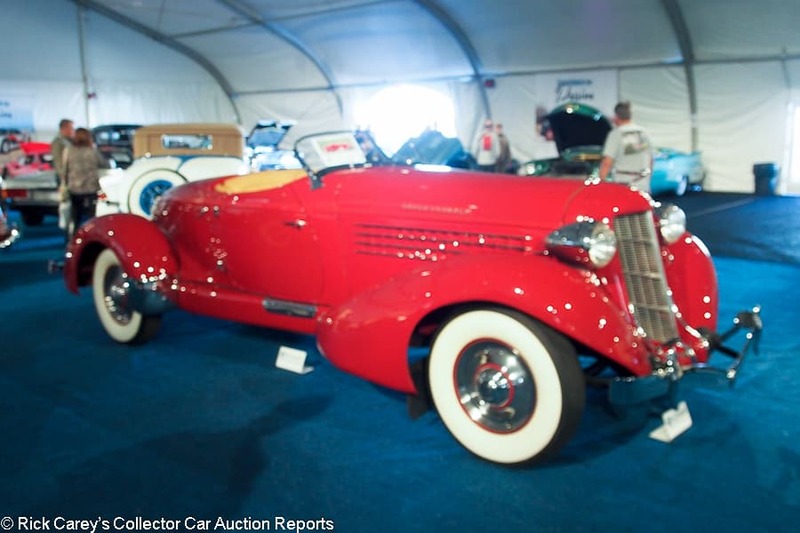 Lot # 34 1931 Cord Front Drive L-29 Cabriolet; S/N 2928916; Maroon, Black accent/Black leather; Black cloth top; Estimate $240,000 – $280,000; Older restoration, 2- condition; With Reserve; Hammered Sold at $220,000 plus commission of 10.00%; Final Price $242,000. – Black wire wheels, Firestone blackwall tires, rumble seat, luggage rack, Twilite headlights – Represented as the original engine, chassis and body. Polishing swirled paint, excellent chrome, fresh interior and tight-fitting top. The engine compartment is like new. Freshly restored but with flaws here and there (scuffed right door hinge, tiny chips behind the top, a series of blemishes on top of the right front fender, gouges at the center of the front axle) that mean it needs attention before it can be shown with confidence. – Sold by RM at Amelia in 2017 for $187,000, then at Auburn Spring in 2018 for $231,000, this L-29 hasn’t sparked anyone’s fancy long enough to become part of the family, a succession of quick turnovers that don’t speak well of it, nor do the many little issues that witness an unusual lack of concern for keeping it up. It brought enough here at Worldwide Scottsdale to give some hope that it will be cherished by the new owner but given its auction history this result is full retail. 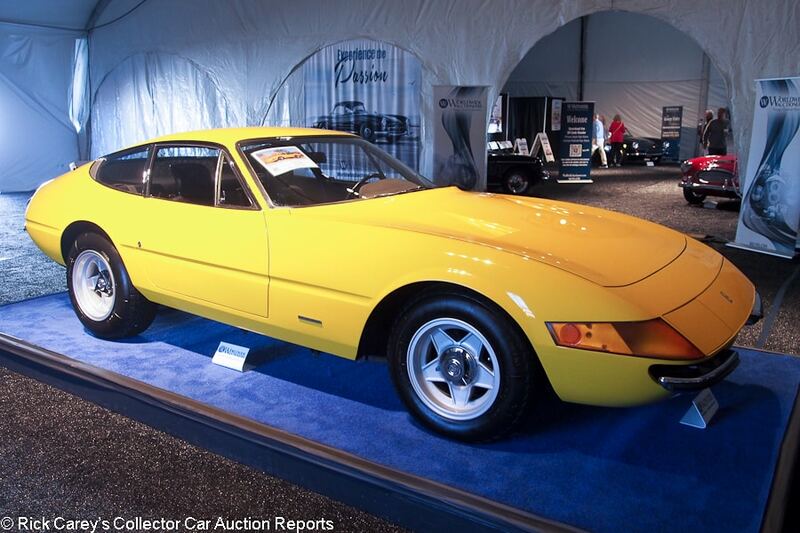 Lot # 30 1971 Ferrari 365 GTB/4 Daytona Berlinetta, Body by Pininfarina; S/N 14279; Giallo Fly/Black leather; Estimate $675,000 – $750,000; Older restoration, 3+ condition; With Reserve; Not sold at Hammer bid of $600,000. – Centerlock alloy wheels, Michelin XWX tires, popup headlights, Becker Mexico cassette stereo, Veglia air conditioning, power windows, Marelli ignition boxes. – Very good repaint, even gaps and flush panel fits. Comfortably stretched upholstery. Good chrome and glass. Older underbody undercoat. The orderly but aged engine compartment with some peeling old paint houses an uprated engine estimated at 400hp. – In early 2019 this is an entirely reasonable offer for a Daytona, even one as well-equipped as this, in this condition. The market for Daytonas isn’t what it once was, there are plenty available and supply and demand still works. It would have been reasonable for Worldwide to take the reported high bid (if it came from a money bidder) and share some of the BP with the seller to make the deal work. 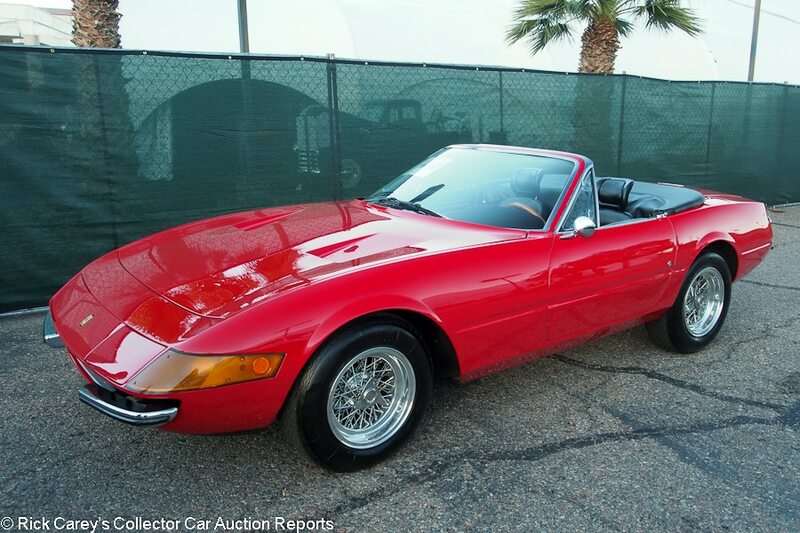 Lot # 53 1969 Ferrari 365 GTB/4 Daytona Spyder Conversion; S/N 12815; Red/Black leather, Red bars; Black top; Estimate $650,000 – $725,000; Visually maintained, largely original, 3 condition; With Reserve; Not sold at Hammer bid of $550,000. – Chrome spoke Borrani wire wheels, Michelin XWX tires, Veglia air conditioning, Becker Mexico cassette stereo, popup lights. – Cut in Europe in the 1970’s by an unknown party. Sound repaint, very good recent upholstery and carpets. Poor chrome on the vent window posts and a crudely touched up chip on the right rear bumper. Dirty old undercoat. Paint crack at the base of the left windshield post. Thin chrome on the left door handle. The top of the engine looks good but the bottom is dusty and a little road grimy. The engine compartment has been black bombed. Not restored but well-maintained. – Sold by Bonhams at Gstaad in 2005 for $197,700 and fully valued here at the reported high bid for a cut Daytona with sketchy history. 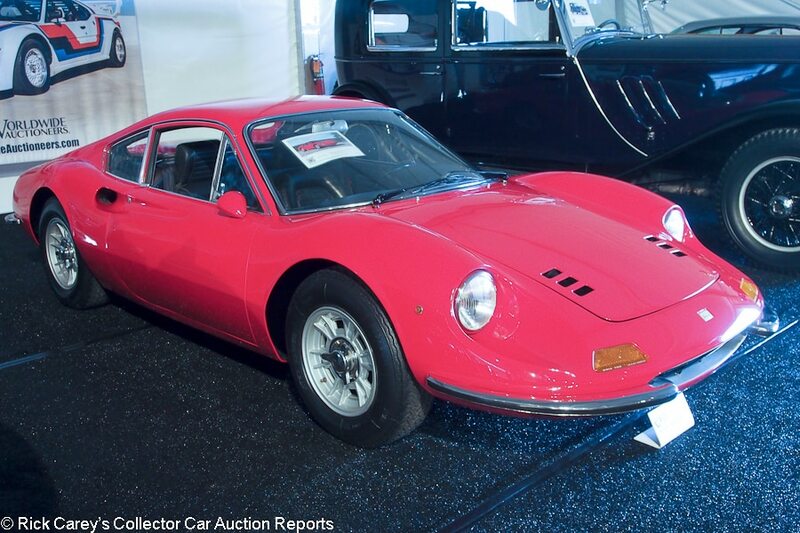 Lot # 42 1969 Ferrari Dino 206 GT Berlinetta; S/N 00184; Engine # N45; Red/Black leather; Estimate $525,000 – $625,000; Visually maintained, largely original, 3 condition; With Reserve; Not sold at Hammer bid of $450,000. – Cromodora centerlock alloy wheels, Michelin XWX tires, leather rim steering wheel (original included). – Two owners from new, 29,041 km. Decent older repaint, wheel wells painted over old undercoat. Orderly, clean and dry but not restored engine compartment. Scratched dashtop and instrument panel with slightly foggy gauge lenses. Worn and creased original upholstery. Not fully restored but good enough to drive with pride. – Despite having fifteen fewer horses than the successor Dino 246GT, the aluminum bodied 206GT is lighter and even more agile. This car with its limited Ferrari mechanic ownership history is highly original, yet wasn’t valued for originality in the bidding, which was reserved and highly conservative. It would not be expensive at its low estimate. 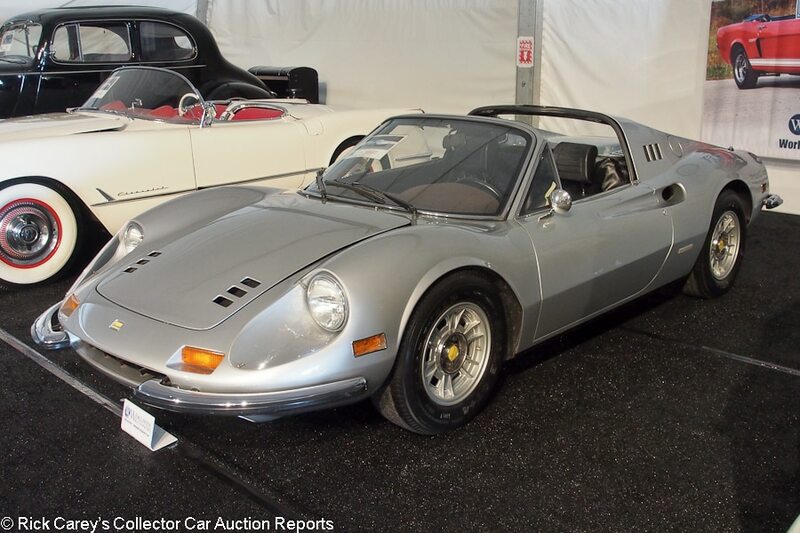 Lot # 10 1973 Ferrari Dino 246 GTS Spider, Body by Pininfarina-Scaglietti; S/N 06274; Silver/Black vinyl; Estimate $275,000 – $325,000; Visually maintained, largely original, 3 condition; With Reserve; Hammered Sold at $235,000 plus commission of 10.00%; Final Price $258,500. – Concord cassette stereo, Borletti air conditioning, Cromodora alloy wheels, Eagle GT+4 tires, covered headlights, headrest seats, power windows. – Represented as the original engine. Restored in the Naughts with decent clearcoat paint, sound older interior. Original undercoat in the wheel wells. Good dashtop and gauges. Fair chrome. A driver quality Dino with no evidence of recent servicing offered. – This is a reasonable result for a sound Dino Spider with a visibly aging older cosmetic restoration. As a practical matter it needs nothing more than to be maintained. The lack of recent service history, though, suggest that a thorough mechanical check is order, a project that is not going to be inexpensive, and that contingency is reflected in the price it brought. 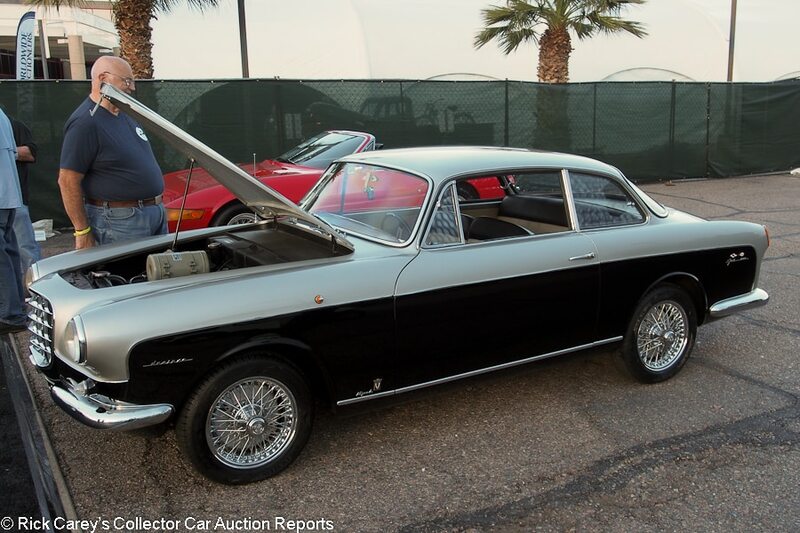 Lot # 51 1956 Fiat 1100/103 E TV Desiree Coupe, Body by Vignale; S/N 332266; Silver, Black/Black vinyl, Grey cloth; Estimate $225,000 – $275,000; Recent restoration, 2- condition; With Reserve; Not sold at Hammer bid of $200,000. – 1,205/55hp, 4-speed, chrome spoke Borrani wire wheels, Vredestein tires, Condor radio. – Good paint, some pitted aluminum bright trim. The engine compartment is orderly and not over-restored, just done close to like new, as is the underbody and chassis. Good upholstery, rusty headlight dip handle and faded speedometer face. 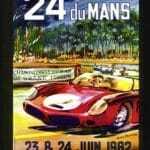 Has been invited to participate in the Mille Miglia Storica. 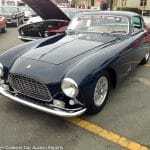 – There is a lot going for this Vignale-bodied Fiat, most significantly its limited production (reportedly one of no more than three) coachwork. While 55hp isn’t a lot it was enough to capture two classes in the 1957 Mille Miglia. On the other hand the tall, rounded, grille is something only a Hyundai or Kia stylist could savor, a splurge of egg-crate chrome that teeters precariously atop the nose of otherwise balanced coachwork designed by Giovanni Michelotti and executed by Alfredo Vignale. The bidders didn’t get the message. 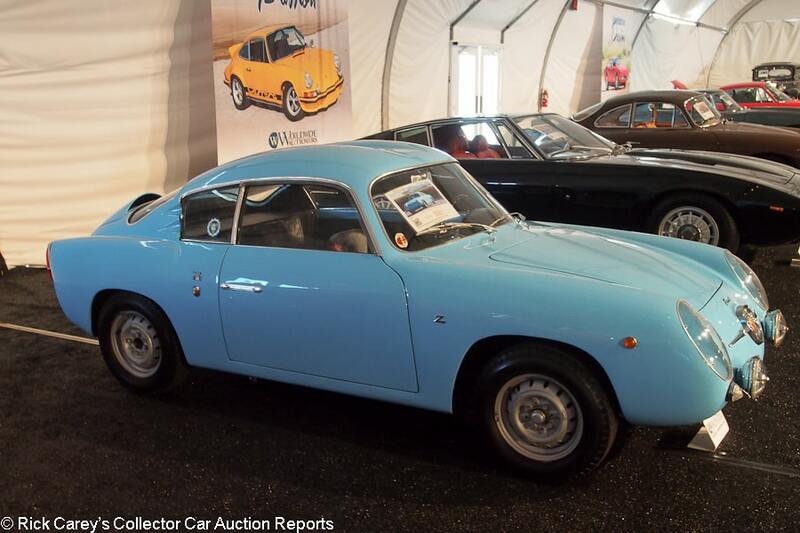 Lot # 25 1959 Fiat-Abarth 750 GT Coupe, Body by Zagato; S/N 100585940; Light Blue/Black vinyl; Estimate $125,000 – $150,000; Visually maintained, largely original, 3 condition; With Reserve; Not sold at Hammer bid of $95,000. – Lucas headlights and driving lights, silver steel wheels, Dunlop Racing tires, uprated engine with larger carburetor and electronic ignition – Good recent repaint and seat upholstery. Scratched windshield and headlight covers. Dirty old underbody with crusty undercoat. Sound interior with some age and wear. Crazed speedometer face, pitted instrument bezels, some peeling interior paint. Orderly engine compartment. A usable driver. – Sold for $134,750 by Gooding & Co at Scottsdale in 2014, then again by them at Pebble Beach in 2015 for $126,500, the seller’s reluctance to accept the high bid here is understandable, even if it fails to impress purists with the modified engine. It’s worth more than the reported high bid. 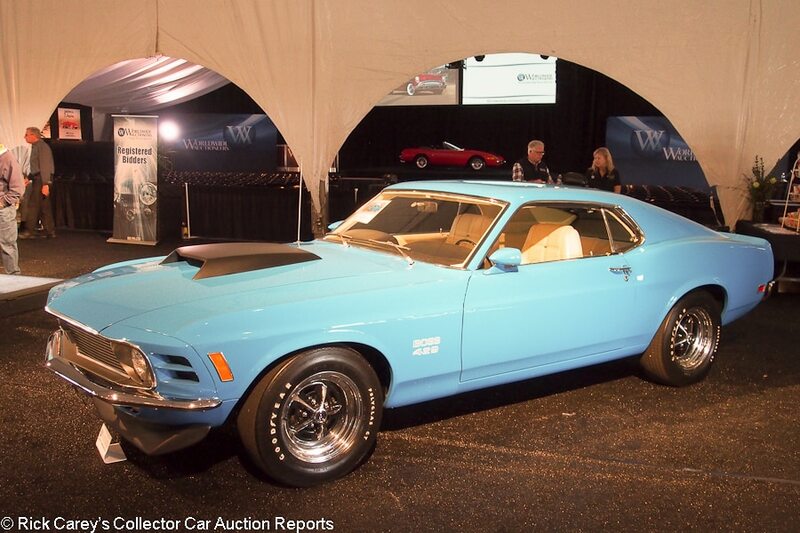 Lot # 48 1970 Ford Mustang Boss 429 Fastback; S/N 0F02Z129405; Grabber Blue, Black hood scoop/White vinyl; Estimate $290,000 – $310,000; Recent restoration, 2 condition; With Reserve; Hammered Sold at $225,000 plus commission of 10.00%; Final Price $247,500. – 429/375hp, 4-speed, Hurst T-handle shifter, styled wheels, Polyglas GT tires, pushbutton radio, 3.91 Traction-Lok, power steering and brakes, Marti Report and original paperwork documented, KK #2346. – Beautiful shiny paint, like new engine compartment and underbody. Sharp and seriously impressive. MCA Concours Gold recipient with 994 of 1,000 points. – Offered by Barrett-Jackson at their Northeast auction in 2017 with a reported high bid of $250,000, then sold at Mecum’s Spring Classic in Indianapolis in 2018 for $275,000, this is a flawless Boss 429 bought at a price that reflects how many of them there are in the market recently. 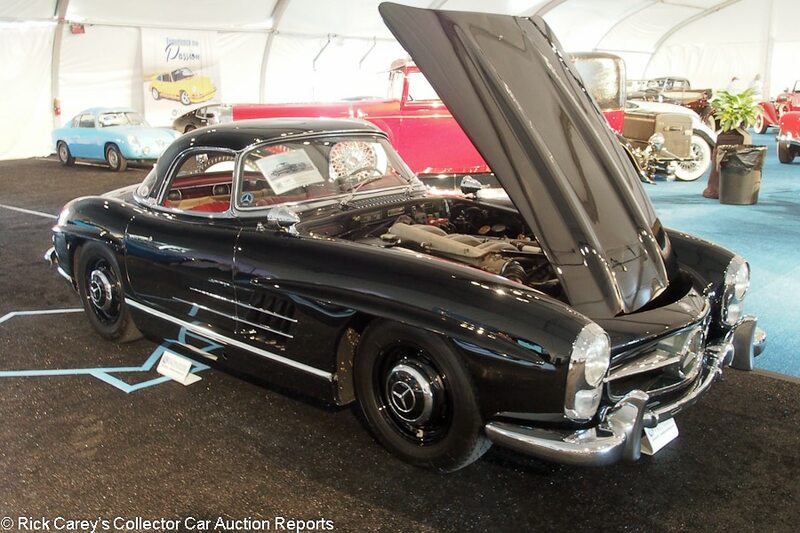 Lot # 20 1959 Mercedes-Benz 300SL Roadster; S/N 198042; Black, Black hardtop/Dark Red leather; Black cloth top; Estimate $1,000,000 – $1,300,000; Visually maintained, largely original, 3+ condition; No Reserve; Hammered Sold at $900,000 plus commission of 10.00%; Final Price $990,000. – Body color wheels and hubcaps, Michelin XVS tires, VDO clock, no radio, dual Talbot outside mirrors, both tops, luggage, aircraft-style seat belts. – Good ancient repaint with expected stone and edge chips and buffed through behind the top. Cracked original leather. Aged but not failing chrome. Clean unrestored but well-maintained engine compartment. Old, faded soft top, new fitted luggage. Three owners from new and coddled by all of them while being used recently in many long distance tours and events. An HVA Preservation Award winner in 2017. – Back in 1991 this 300SL was offered by Guernsey’s auction house in Bridgehampton where it brought an unsuccessful high bid of $231,000. It didn’t look much different then than it does today. The result here is a sound value for the new owner who can look forward to continuing to use it with pride and confidence. 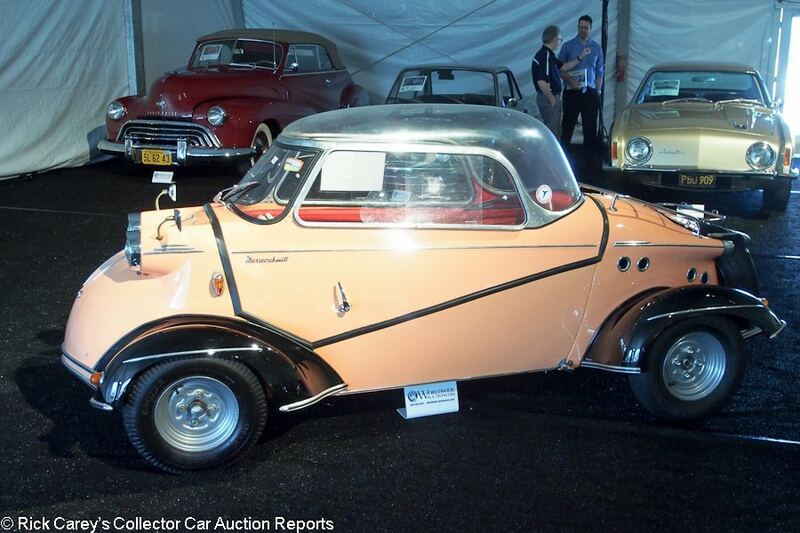 Lot # 32 1959 Messerschmitt KR200 Bubble top; S/N 71643; Pink, Black fenders/Red vinyl, Grey cloth; Estimate $45,000 – $65,000; Modified restoration, 3 condition; No Reserve; Hammered Sold at $41,000 plus commission of 10.00%; Final Price $45,100. – 2-cylinder, 601cc/35hp Trabant engine, dual rear wheels and fenders in Tiger style, tandem seats, Plexiglas bubble top, Smiths tach, luggage rack, rear-mounted spare, dual outside mirrors, sliding side windows, silver wheels, Kumho tires. – Sound older paint, chipped engine cover corners and scraped right side lower body panel. Good upholstery. Dull, scratched aluminum bright trim. Pitted chrome latches. Usable but far from the “show field” ready car described and not the FMR Tiger it emulates. – If the buyer’s motivation was to have a fun and unusual car the price paid was reasonable, but it’s only a highly modified KR200 with Trabant power and only in a KR200 would a Trabant engine swap be considered even remotely desirable. Even at that, though, it’s hard to argue with the value in this Messerschmitt at this price. 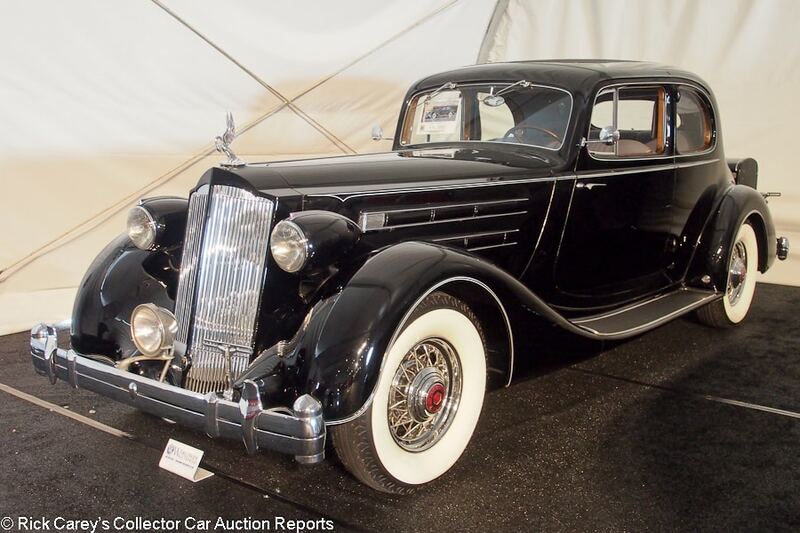 Lot # 8 1936 Packard Twelve Model 1407 Coupe; S/N 937209; Black/Blue-Grey cloth; Estimate $120,000 – $150,000; Unrestored original, 3+ condition; With Reserve; Hammered Sold at $105,000 plus commission of 10.00%; Final Price $115,500. – Chrome wire wheels, wide whitewalls, luggage trunk, radio, heater, quarter and rear window shades, fog light, includes a set of Michelin radial tires. – The 9th of only 10 built in this body style. Old repaint buffed through in a few places. Good replaced upholstery. Some chipped edges and generously chipped through original paint in the wheel wells. Highly original, in great shape and well worth preserving with a history of discerning Packard collector owners who have cherished and preserved its condition. – Offered by Bonhams at Greenwich in 2010 with a reported high bid of $75,000. The luggage trunk hanging off the back is anomalous, fudging up the otherwise attractive lines of this 5-window coupe design. Leave it at home unless it’s being driven on a thousand mile tour. This is a Packard that deserves to be preserved as it is and will reward its new owner with both a moderate price for a Twelve and worthy preservation awards, a sound value. Lot # 69 1966 Pontiac GTO 2-Dr. Hardtop; S/N 242176P132960; Engine # 107978YR; Red/Black vinyl; Estimate $35,000 – $55,000; Cosmetic restoration, 3 condition; No Reserve; Hammered Sold at $33,000 plus commission of 10.00%; Final Price $36,300. – 389/360hp Tri-Power, automatic, power steering and brakes, air conditioning added, Rally II wheels, F70-15 Polyglas tires, chrome alternator, woodgrain steering wheel rim, buckets and console, pushbutton radio, high-torque started, uprated radiator, fan and water pump, Pertronics electronic ignition. – Mediocre repaint with spots on the front fenders and a big crack on the right front fender. Oily, used engine compartment with fuel and oil residue on the carbs. Modern hose clamps and aftermarket air filters. Good major chrome but thin, scraped exterior drip moldings. Sound upholstery, good dash and gauges. A driver. – The lack of any documentation for this GTO is troubling, a deficiency reflected both in the pre-sale estimate and in the final result. 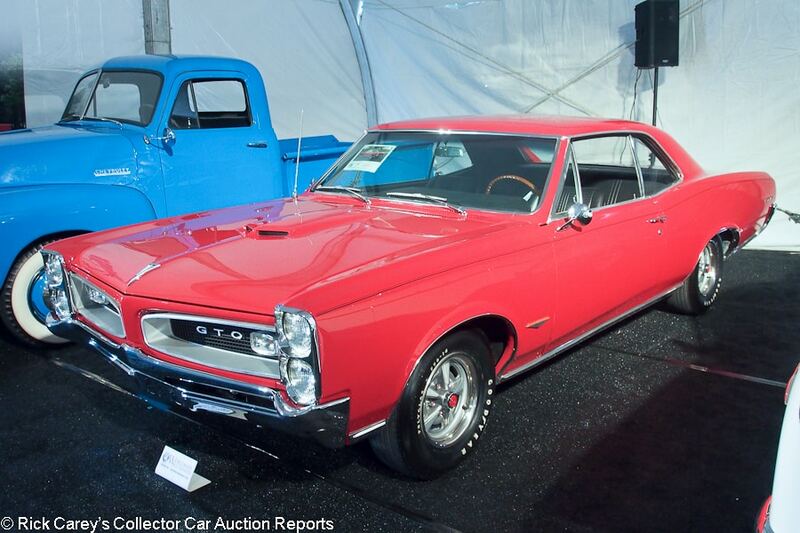 With the various upgrades and aftermarket A/C it is a driver’s GTO, but definitely a GTO, and it brought a price that is appropriate, but also a sound value in performance, comfort and style. 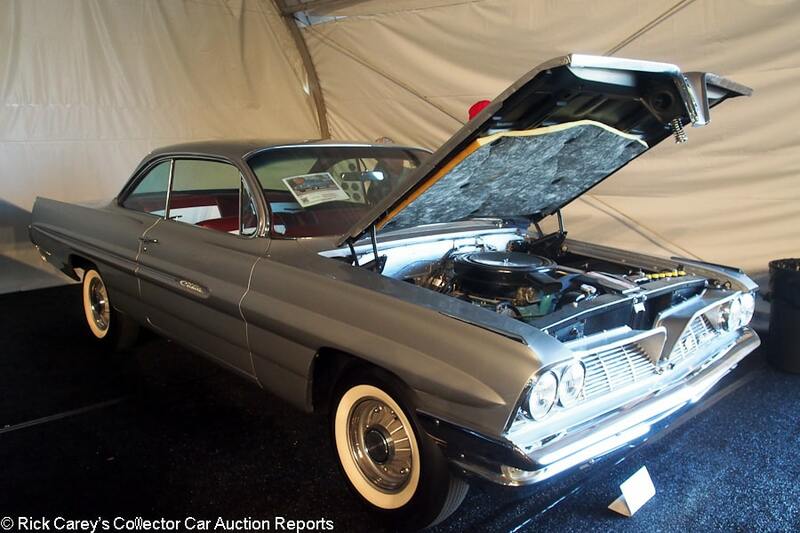 Lot # 59 1961 Pontiac ‘Trophy 425A’ Catalina 2-Dr. Hardtop; S/N 361P10735; Engine # No; Richmond Grey/Metallic Red vinyl, cloth; Estimate $120,000 – $140,000; Older restoration, 2- condition; With Reserve; Not sold at Hammer bid of $80,000. – 389/348hp Tri-Power, 4-speed, 3.90 Saf-T-Track, radio and heater delete, 8-lug wheels, bias ply whitewall tires, clear steering wheel rim, bench seat, PHS documented with a copy of the original manifest. – Very good paint, chrome and interior. The engine compartment was restored like new but has aged and the car is changed from its original configuration which included steel wheels, wheel covers, radio and heater. Period drag racing documented with window decals including some from Connecticut Dragway (the present home of Consumer Reports.) 2017 POCI Gold winner. – The consignor was looking for 421 Super Duty money for this 389/348 Tri-Power Catalina, an admirable goal but not one that is supported by the facts. The bid here reflects the high quality of the restoration and the consignor’s assiduous representation of it during the preview. It would have been reasonable to take it, with some satisfaction. 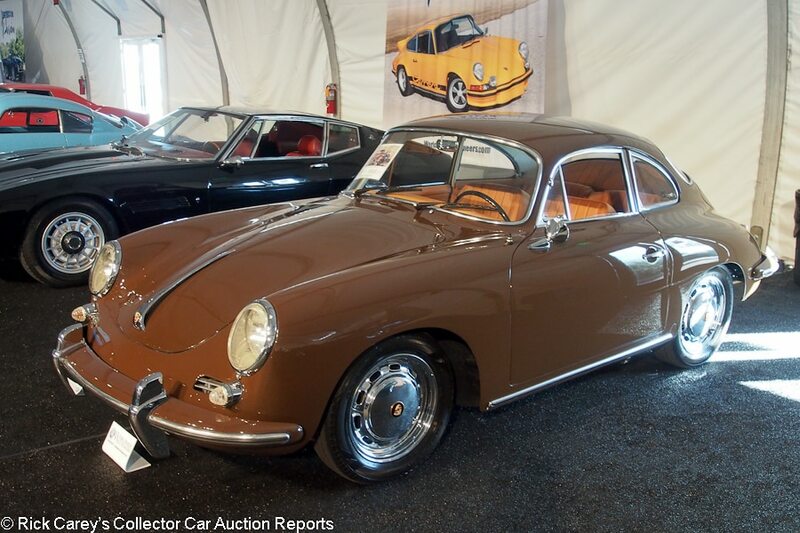 Lot # 14 1965 Porsche 356 SC Coupe, Body by Reutter; S/N 220122; Engine # 813014; Togo Brown/Fawn leather; Estimate $110,000 – $130,000; Older restoration, 3+ condition; With Reserve; Not sold at Hammer bid of $90,000. – Blaupunkt multiband radio, VDO clock, chrome wheels, blackwall tires. – Represented as the original engine. First owner until 2016. Scratched steering wheel rim. Very good new interior. Good older paint with minor polishing swirl, good chrome. Orderly but not fresh engine compartment. A good driver Porsche. – Maybe the Worldwide bidders didn’t like Togo Brown because this is a decidedly meager bid for a 356 SC Coupe with a long single owner history and reassuring presentation. 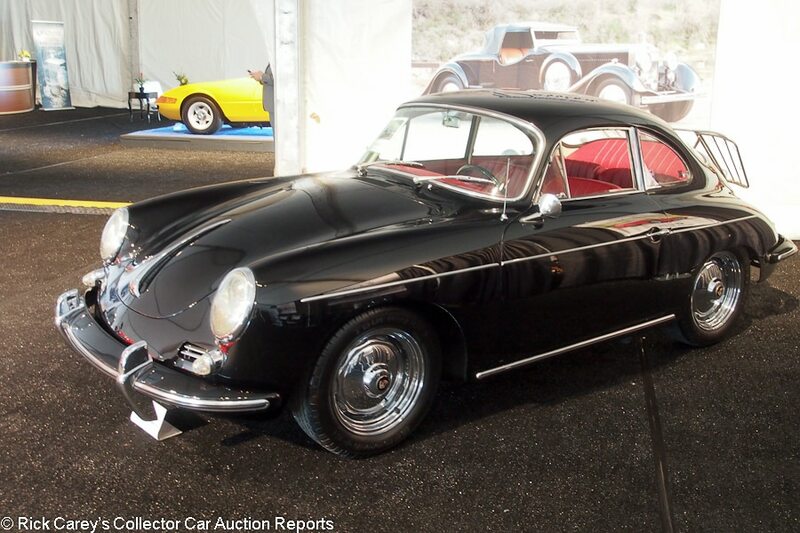 Lot # 33 1963 Porsche 356B Super Coupe, Body by Karmann; S/N 213587; Engine # P705889; Black/Red vinyl; Estimate $80,000 – $100,000; Visually maintained, largely original, 3 condition; No Reserve; Hammered Sold at $65,000 plus commission of 10.00%; Final Price $71,500. – Chrome wheels, hubcaps, Touring T/A tires, luggage rack, Blaupunkt multiband radio, Porsche CofA documented. – Represented as the original engine. Orderly engine compartment, Solex carbs, some dust and fuel leakage stains. Scuffed old paint with dust inclusions and edge chips. Good upholstery, dash and gauges. Old undercoat in the wheel wells. Filled body panels. Aged and used but appears to have had good, consistent care. 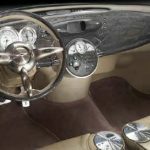 – A sound and attractively maintained 356B Super in good driver condition, it brought a realistic price in this transaction, despite the vaunted pre-sale estimate. Bargain hunters were on the prowl in Scottsdale this year and while this isn’t a “bargain”, it is a sound and enjoyable Porsche bought for a wholesale price. 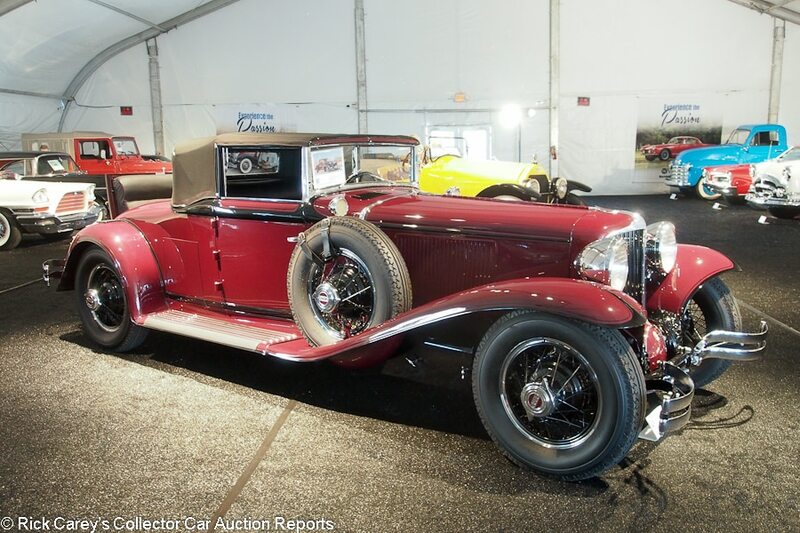 Lot # 5 1930 Stutz Model LA Blackhawk Roadster; S/N 17400; Engine # 17400; Black, Red beltline/Dark Red cloth; Faded old top; Estimate $70,000 – $90,000; Unrestored original, 4 condition; No Reserve; Hammered Sold at $62,000 plus commission of 10.00%; Final Price $68,200. – 252/85hp overhead cam inline six, 4-speed, red wire wheels, Dunlop Racing tires, dual sidemounts, rumble seat, steering column mounted SW mechanical tach. – Faded, chipped original paint, dull chrome, rusty radiator shell. Greasy, oily engine compartment and chassis. A tired but complete and sound barn find that needs everything but is a straightforward restoration project. – And it is a marvelous old thing in unusually good and complete condition as well as being said, given its neglected condition, to run and drive well. Restored it deserves a $200K value, but wouldn’t it be more enjoyable to enhance its drivability, preserve its condition and drive it? That is its value. 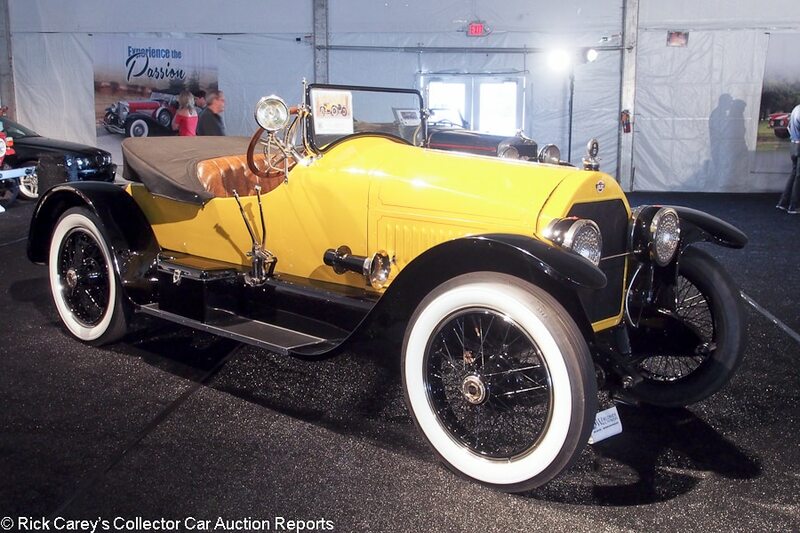 Lot # 40 1920 Stutz Series H Bearcat Roadster; S/N H5414; Yellow, Black fenders/Saddle vinyl; Black cloth top; Estimate $280,000 – $340,000; Older restoration, 2- condition; With Reserve; Hammered Sold at $260,000 plus commission of 10.00%; Final Price $286,000. – RHD. 4-cylinder 361/80hp T-head 4-valve/cylinder engine, black wire wheels, whitewalls, rear-mounted spare, single Sportlite, Sparton horn, drum headlights, Warner speedometer. – Orderly engine compartment with oil leakage. Clean, dry chassis. Sound upholstery. Good paint looks newer than the chassis restoration. A great car for tours and events but not for show. – This isn’t the monocle windshield Bearcat of the Teens, but it’s still unruly and sporting with a great thumping four-cylinder heart that seems to thrust it forward with every measured power stroke from its 90 cubic inch cylinders. 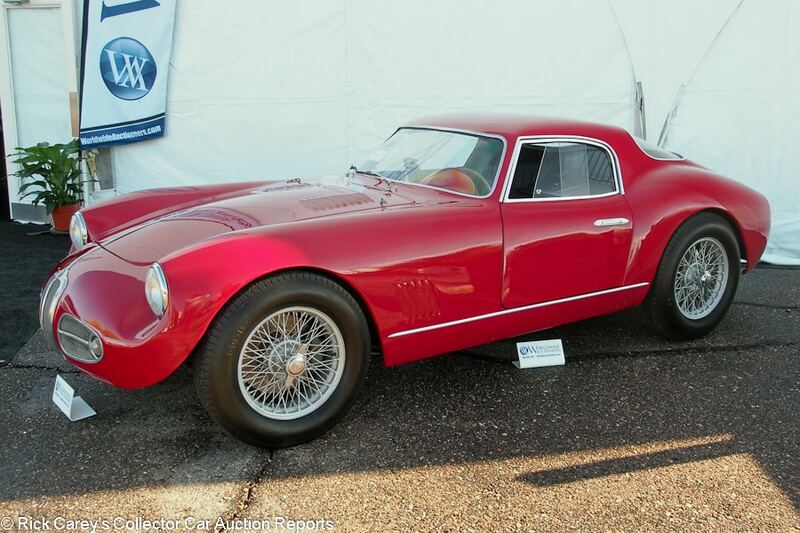 The Worldwide Scottsdale bidders liked it, conferring upon it a generous but not onerous price. 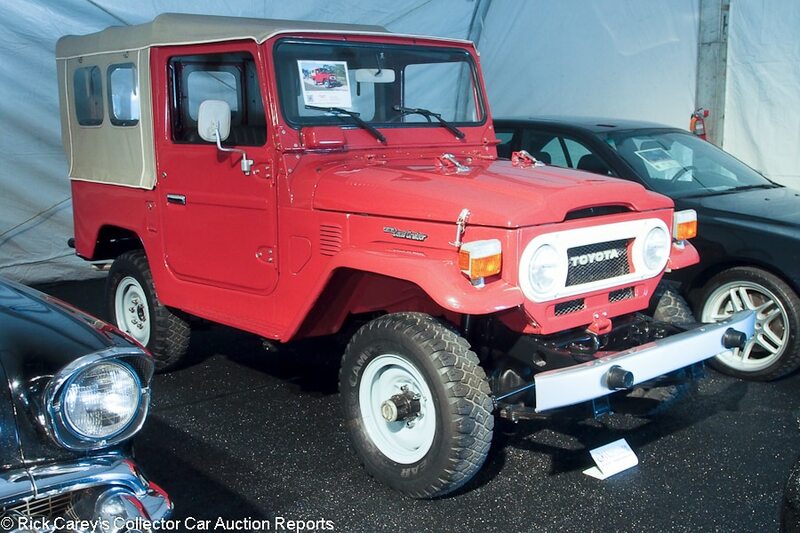 Lot # 65 1978 Toyota FJ40 Land Cruiser Utility; S/N FJ40269532; Brick Red/Black vinyl; Grey vinyl top; Estimate $40,000 – $60,000; Truck restoration, 3- condition; No Reserve; Hammered Sold at $32,000 plus commission of 10.00%; Final Price $35,200. – Aisin front hubs, center-facing rear seats, power steering. – Body and chassis were quickly repainted assembled. Sound upholstery and top. A utility restored Land Cruiser. – With metric gauges it’s fair to infer that this is one of many Land Cruisers being rescued from Central American ranches and farms and brought back to the U.S. for a quick redo. In this case the consignor missed the market’s peak and realistically accepted the judgment of the Worldwide Scottsdale bidders, which is right on the money. Yeah, I missed that one. I took its picture but somewhere between writing up the Fiat-Abarth-Zagato and the Togo Brown 356 Coupe I got distracted and never actually viewed and took notes on it. In retrospect that’s peculiar, since I think a Ghibli is prettier than a Daytona, just as fast and a lot less money. Not my comment, although I wish it were. Lot # 48 1970 Ford Mustang Boss 429 Fastback – No sale in 2017 at 250k, sold in 2018 for 275k, sold in 2019 for 225k. Are these cars that I see rolling from auction to auction put up by dealers or individual speculators? This seller didn’t do too well. Thanks. There are many in the market and they seem to be moving from place to place searching for someone who didn’t get the memo and is still willing to pay top dollar. In addition to this one at Worldwide there were four at B-J, selling for $286,000 (also sold at Mecum Indy in 2012 for $265,000), $247,500 (also sold at Auctions America Ft. Lauderdale in 2014 for $209,000 and a No-Sale at Indy last May on a reported $230,000 bid), $231,000 and $150,700. All of them were Saturday cars with good docket placement but the last one had a replacement engine and a few performance modifications. The bidders’ reaction to that is apparent. I think most of these are dealer-owned (I know for certain that one of the B-J cars was), bought in fond anticipation of yet another up-cycle in Boss 429 values that has been quenched by ample supply. Talk soon to catch up.